UCF is calling. If you really want to get a sense of what we’re all about, plan a campus visit. Walk our palm tree-lined pathways. See the smiles of your future classmates. Talk to faculty. Get your questions answered by admissions representatives and student ambassadors who are here to help you. You’re going to love our big, warm, welcoming vibe. When: Monday through Friday (except holidays) at 10 a.m. and 2 p.m.
Where: Check in at the Duke Energy UCF Welcome Center. 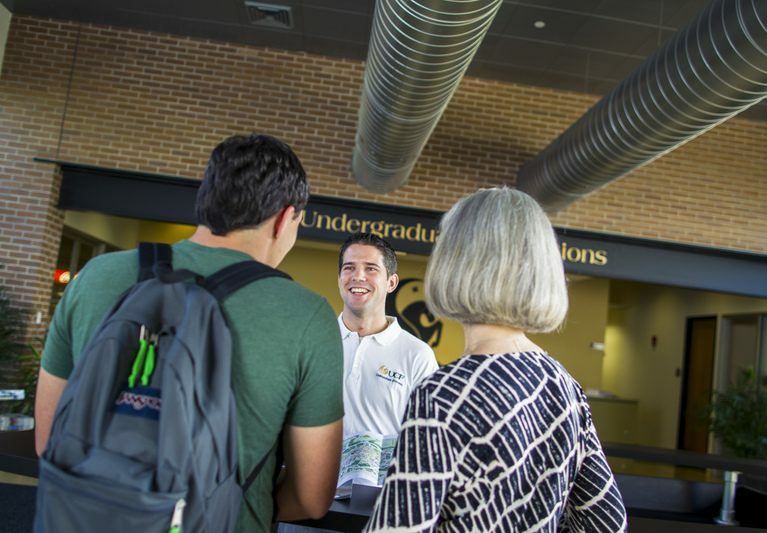 Weekday campus tours begin at the Duke Energy UCF Welcome Center with a 30-minute information session, followed by a 90-minute walking tour of the campus led by a UCF student ambassador. You may preview our residence halls before or after your tour. Campus tours fill up quickly, so sign up today. Click to reconfirm a previously-scheduled campus tour. You will need to enter the email address you provided at the time of registration. Already scheduled your campus tour and need to cancel? Enter your confirmation code at the bottom of the Campus Tour Confirmation page. When: Selected Saturdays throughout the year: from 9 a.m. to 3 p.m.
Where: Check-in begins at 8 a.m. in the Pegasus Ballroom in the Student Union. These Saturday events are designed to introduce students and families to UCF. You’ll learn about the application process, academic programs, student life and financial aid in a comprehensive daylong program. Reservations are strongly encouraged. Registration for Fall 2019 events will open in June. Visit the Open House Confirmation page if you need to reschedule your visit. Want to explore campus on your own? The self-guided walking tour begins in front of Millican Hall at the Reflecting Pond, and it concludes at the Recreation and Wellness Center. There are 10 stops on the self-guided tour. 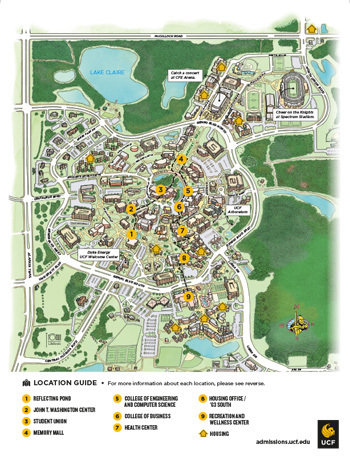 Come early or stay late — tours of UCF housing are offered before and after our daily campus tours. You can view at least one style of our residence hall rooms. When: Monday through Friday (except holidays) at 12 p.m. and 4 p.m.
Where: Check in at the Recreation and Wellness Center Lobby. 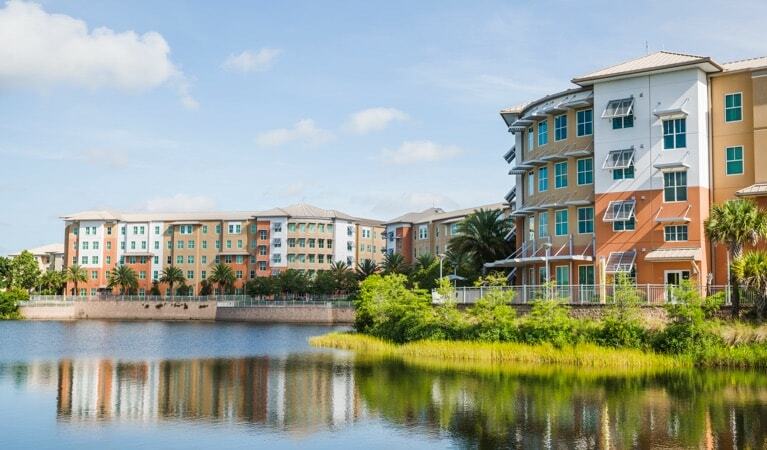 When: Monday through Friday (except holidays) between 9 a.m. and 4 p.m.
For meeting locations, video tours and other information about housing and housing tours, please contact UCF Housing and Residence Life. Browse all admissions forms and make your application journey easy and worry-free. Review UCF’s undergraduate admissions requirements to be considered for admission. We’ve made it easier than ever to apply to UCF. Start your application today. Tues, Wed, & Fri: 9 a.m. - 5 p.m.
*Phone lines close at 5 p.m.